All the promise shown in the opening games came to fruition on a balmy day in the sunshine of the northeast. Dale played well enough to edge the first half by 17 points to 13. Dan Tai crossed twice and Cameron Hudson scored with Jamie Guy converting one of them. In reply Thomas Gulland crossed for a catch and drive which Andrew Baggett converted. Baggett was also successful with two penalty attempts to keep Blaydon in touch. 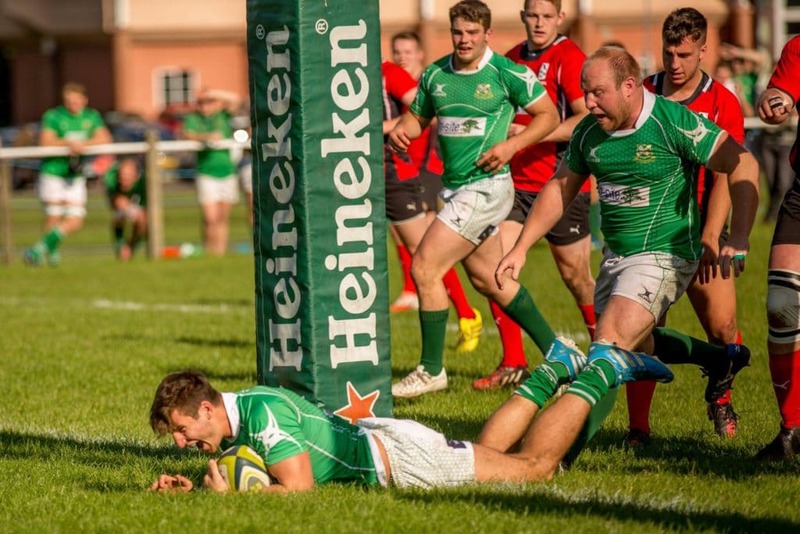 The Wharfedale backs cut loose in the second half and added four more tries. Some of the rugby was breathtaking. Tiny glimpses of gaps were exploited and superb handling and support led to a scintillating display. Man of the match, Cameron Hudson, opened the half with two more tries, with Guy converting them both. The lead had stretched to 18 points and a bonus point was in the bag. Maxime Labasse finished an excellent running move before James Doherty scored Dales seventh try. Jamie Guy rounded off the scoring from the tee. The main difference to the opening games was the control of the line out winning 13 out of 14 and winning well. Credit must be given to the influence of on loan player Richard Beck. His work in the line was excellent and gave others confidence to lift their standards. A second major improvement was in defence. The glory boys may have scored all the tries but it was the tireless work of the forwards that held Blaydon and either forced turnovers and mistakes or forced the home side to kick possession away. It was the forwards that, although under pressure at the scrum, held their own ball and, as the match wore on, gained at least parity in the set piece. Another factor in the win was the support play. When a half break was made players were there to press home the advantage and Blaydon were saved from an even bigger score by some superb cover tackles. Cameron Hudson won the Star Man in the Rugby Paper for his outstanding work in attack and defence but all players really stepped up their performance to produce this superb victory. Harry Skelton stepped in at scrum half, for the first half, and showed that he was very capable of playing at this level. Maxime Labasse, Dan Tai and Oliver Cicognini all enjoyed the day and showed their skill in developing play when given half a chance. All three also joined in with solid work in defence. One tackle by Tai stood out as he tackled a forward and drove him back. Watchers assumed that it was a strapping forward doing the work! A smiling Head Coach, Tom McGee, summed up his thoughts by saying “The brand of rugby that the Greens are playing is amazing to watch. The line out was a solid platform and provided plentiful ball for the backs to use. In the match against Blaydon we saw, in patches, how we as a group aspire to play our rugby. Our energy, enthusiasm, skill and movement was translated into good periods of phase pressure, width in our defence and into a high kick chase line. The guys looked like they were having fun by the way we were playing. The main themes through the training week were to start well, control the field, get points on the board early which we did. Looking back at our 1st 2 fixtures we were chasing games after 30 minutes which is never a good recipe for success. It’s a part of our game we’ll continue to work and focus on. Our approach was much more direct through forwards and centres which allowed our back 3 to run freely in space against a narrow Blaydon defence. We finished very well in offload, pushing through in support – some of the individual finishes were outstanding.